If you are tasked with cleaning up a sports website, there are 6 key areas that will give your website a fresh new look with minimal effort and time involved. We have compiled these sports website design resources into a 1-page Sports Website Cleanup Checklist which you can download here. Your website is the front door to your organization and should be warm, friendly and welcoming. It's often not necessary to make a complete service provider change in order to get the new look you want. Of course, if there are other issues with your system, such as poor customer service, difficult to use, or high usage costs, a change is probably warranted. How often should a sports website be updated? As a rule of thumb, sports websites should be updated bi-monthly with new images and as frequently as needed to keep the information accurate and up-to-date. If your registration information page is still showing pricing from 2014, you need an update! If your Board page is showing people who are no longer on the Board or serving in the wrong position, you need an update! If you ever see 404 Error, Page Not Found or if a section stills says Under Construction, you need an update! If the team shown on your home page no longer plays in your league or association, you need an update! If you have new uniforms and the image on your home page shows the old ones, you need an update! If you have changed your logo and the website still shows the old logo, you need an update! If you have more than 1 year's worth of news and announcements shared on the site, you need an update! If your website can't easily be used from a mobile device, you need a major update! When should a sports website get a major overhaul? A sports website should receive a major overhaul about every 3 years. A major site overhaul is more about updating the underlying website technology than the public facing images, text, colors or layout. Website technology and user preferences change over time and a major update will bring your site back inline with current technology. What's the #1 change to make? Aside from updating photos and news regularly, the #1 area of concern on your website is it's mobile responsiveness. If your site does not automatically reconfigure to allow for ease of viewing and use from a mobile device, you found your mission! In youth sports, well over 60% of website traffic originates from a mobile device, so by upgrading your website and registration system to one that is mobile responsive will be in line with your visitor's communication preferences. Visit our blog on Mobile Responsive Design to learn how you can test your site's mobile responsiveness. Good luck on your cleanup efforts. 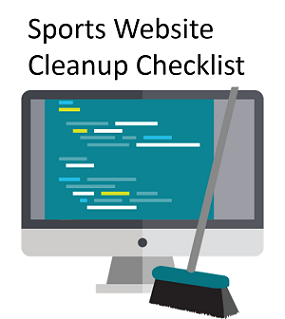 Focus on the key areas mentioned in our Sports Website Cleanup Checklist and you will have a fresh, clean site in no time. And, if you need help, don't hesitate to contact Engage Sports where we deliver a completely built out website, so that you can Work Less and Play More! As a former softball coach and veteran business leader, Paul Langhorst is on a mission to help sports associations and leagues improve their operations and experience for players, parents, fans and their volunteer leaders. Do you run a youth sports organization? Check out our e-book, "Effective Management Strategies for Youth Sports Leaders." Getting the next generation of young parents to step up to the plate.